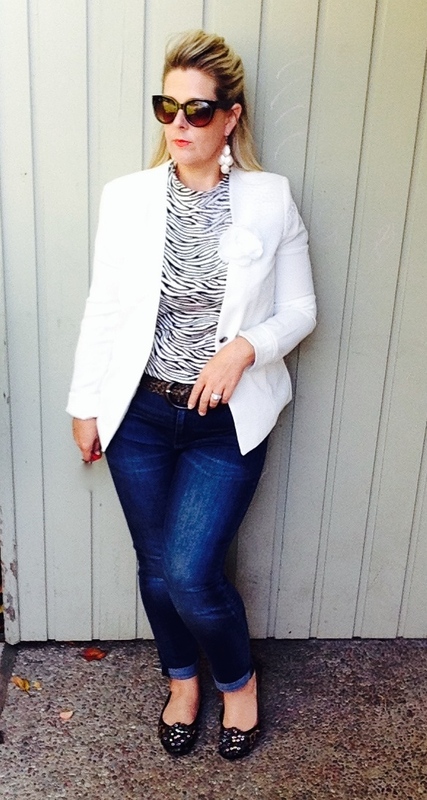 A blazer is a great addition to any wardrobe and one of my favorites in my collection is my classic white blazer! 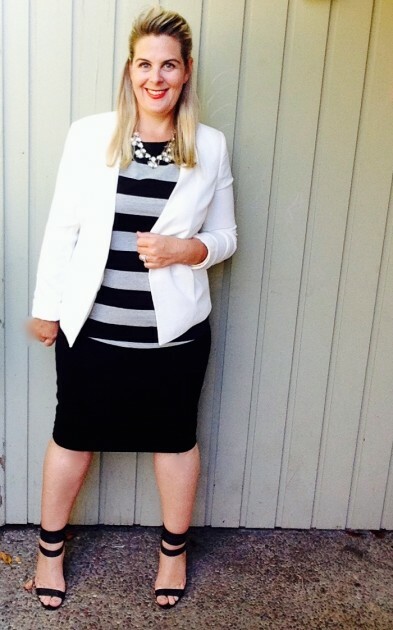 Trust me when I say I have worn this a tonne – over sundresses, casually with jeans, over a cocktail dress, with pants for meetings (this white jacket with black pants is a great monochrome look) – as you can see, it can be pulled into many outfit inspirations! Shoulders – since shoulders are the trickiest part to have tailored/altered, you want to start by getting the shoulders right off the bat. You want the shoulder pads to finish just at the edge of your natural shoulder, not over unless you’re going for a Miami Vice look. You also want to lift your arms up and feel comfortable, not like you have an old school thick sanitary napkins stuffed in there (apologies for graphics). Plus, try, try, try, try and try again many different blazers. It doesn’t matter the price of the jacket (I’ve experienced uber expensive ones with incredibly uncomfortable shoulder pads) – it’s how it feels for YOU! Length of the arms -The rule of thumb (pardon the pun) is that you want the cuffs to finish at the base of your thumb (stand with your arms by your side for measurement). I love to pull my sleeves up as you can see in my photo, so make sure they are comfortable enough to do this – not too tight. I also love the look of a patterned button down rolled with the blazer cuffs for a preppy look. Who remembers those sleeve holders from the 80’s? I wish they would bring them back, they would come in handy!. The body of the blazer – you want to be able to wave your arms around without feeling restriction or pulling in the back from tightness. Watch that the fit doesn’t drown you especially if your petite. You’ll also want the jacket to show your silhouette as this will help add structure and a more tailored look. On a final note, don’t worry too much if it doesn’t button up comfortably. How many times do you actually button your blazer, seriously??? As long as you have the above points in check, you’ll be good to go. We’ll talk suits another time, but for now, I hope I have provided you some inspiration for having fun with a blazer in your wardrobe. Great post Melissa and perfect timing for me as I am currently scouting a white blazer ?? Ok, you’ve got me wanting a white blazer. Is ours pure white or a winter white? That’s where I am stuck. I will most likely wear mine back to black. Thanks for the tips on the fit, as always – a super informative post! Thank you for the tips! I’m gonna pull out my blazers from my working days and give them some love ?